If your brick mailbox door is broken or missing we can help. The Birmingham Handyman offers an affordable, durable brick mailbox door replacement system. Our brick mailbox replacement doors are installed without the need for any major modification. You won’t need a brick mason or a new mailbox. Our system replaces the mailbox door and hinges. With your new mailbox door installed, the beauty and functionality of your brick mailbox is restored without a big hassle or expense. Your new mailbox door will provide many years of service and beauty. High quality steel brick mailbox replacement door and hinge system. The solid steel construction insures durability and the gloss finish provides lasting beauty. Our brick mailbox doors are available in a variety of sizes and colors including black, white and gray. Restore the beauty and functionality of your brick, stone or stucco mailbox with a new door. Our heavy duty brick mailbox replacement door system is also compatible with stone or stucco mailboxes. 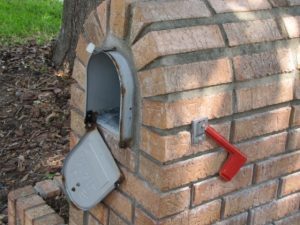 The Alternative Method of Brick Mailbox Door Repair is to replace the whole mailbox. In order to replace the whole mailbox without dismantling the brick enclosure, the old mailbox must be cut out. This method is time consuming and dangerous. 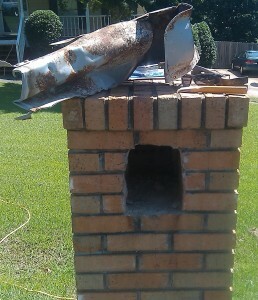 Once the mailbox is successfully removed from it’s enclosure there is another problem. The new mailbox won’t fit. There is a protruding lip on the edges of a metal mailbox. This is where the pieces of the mailbox are put together. This makes the new mailbox too big for the opening. At this point the opening has to be enlarged to accommodate the new mailbox. While it is not impossible to replace the whole mailbox, it is an expensive, time consuming and dangerous method of repair. Our replacement door does not require any modification to the existing mailbox at all. It is simply a door and hinge replacement system that attaches to your existing mailbox. A fast, effective and inexpensive solution to brick mailbox door repair and replacement.